Why Deadlift? To us asking that is akin to asking Why Breathe? 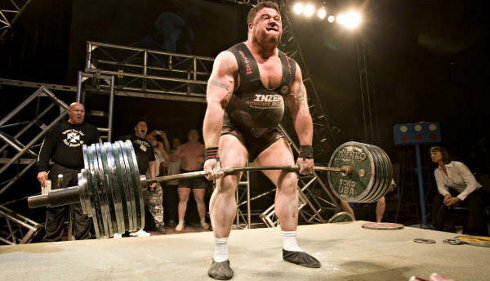 The Deadlift is one of the most ancient, fundamental and just flat out alpha lifts out there. In no other lift do you raise hundreds of pounds of weight off the ground with your bare hands. There’s really something magical about the Deadlift. You just don’t feel the same amount of confidence and joy doing Squats or Bench Pressing as you do while Deadlifting. There’s a reason so many people look forward to Deadlift day. So doing one deadlift is almost like doing In a leg presses, aback extension, lying leg curls, an abdominal crunch, a gripping exercise, a straight-arm pull down and a shrug all at the same time. Yep, its one hell of a compound lift. Another great reason for deadlifting is testosterone and growth hormone release. Studies have shown that compound lifts like the deadlift use the most muscle groups and thus release the most of these 2 crucial chemical compounds. Still not fully convinced by the glory of the Deadlift? Listen to Johnnie Jackson, IFBB Pro and one of the strongest bodybuilders in the world. • Deadlifting helps to increase stability control. While using machines to train muscles will isolate and target only a specific few muscle groups, the deadlift also involves supplementary and minor muscles called stabilizer muscles that are usually ignored by the mainstream. The lack of training of these stabilizer muscles will lead to imbalances and can lead a person to be more susceptible to injury and unsymmetrical physique. • Another huge benefit from deadlifting is increased grip strength. Since the deadlift is one of the few exercises where you must manually hold hundreds of pounds of weight, it is one of the best exercises for increasing grip strength and strengthening the forearms. Increased grip strength will then aid to improve other lifts like the bench press. • Deadlifting is also one the few exercises out there with real world application. Pickup weights off the ground is something we’ve been doing for millennia and is exactly what the deadlift trains the body to do. • If performed correctly the deadlift also strengthens the spine and can lead to better posture. People with lordosis or excessive curving of the spine can benefit from the deadlift as it will help fix their posture by strengthening their lower back muscles, as well as the core, and by ironing out any lower back imbalances. • Cardio. The only two exercises to really make someone light headed are Deadlifts and Squats. Deadlifting really taxes your cardiovascular system, as you already know, or will soon find out. (Pro tip: Make sure you have somewhere to sit down after deadlifting). Some uneducated people and crappy gyms (AKA Planet Fitness) will try and tell you the Deadlift is not a good exercise, and that it’s dangerous, and that you shouldn’t do it. That’s not true at all. Driving a car is dangerous, yet we still do it. Why? Because we learn how to do it first. So read up on Deadlifting Form before you go out there and do a clean set of 5. This entry was posted on February 14, 2013 by BeHench. It was filed under Articles and was tagged with benefit, benefits, compound, deadlift, exercise, gain, glutes, hamstrings, lift, lower back, mass gain, muscle, physical, strength, strengthening, Strong, training. Excellent! Deadlifts are extremely versatile and useful exercise which no one seems to do anymore!